Using MyHDL for digital design is an innovative and unconventional approach, quite unlike today's mainstream design flows that are based on Verilog or VHDL. 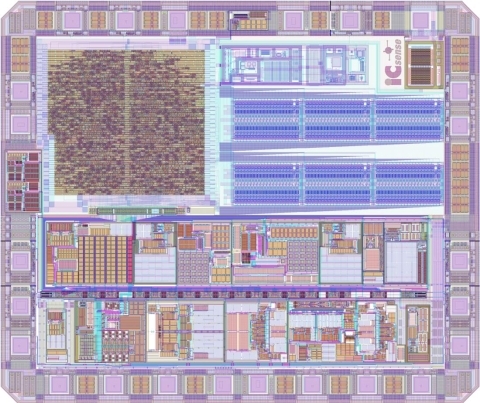 Nevertheless, several successful MyHDL-based FPGA projects have been reported recently. However, the author believes that the present paper represents the first report of the use of MyHDL for the design of a fully processed ASIC product. Data transfer Bit-serial transmitter of CRC-protected measurement data for all channels. Has a mode to send out OTP memory bits. Supports 4 data rates. In traditional HDLs, the most popular types for describing integer arithmetic are signed and unsigned types, modeled after similar types in mainstream programming languages. According to the present author, this situation is far from ideal. These types force HDL designers to deal explictitly with bit representation issues. The result is code with a lot of explicit type casts, sign extensions and resizings, even for simple integer operations. It is often claimed that the bottleneck in today's HDL design flows is not so much the design implementation itself, but the verification task. As a result, a number of innovative verification solutions have been developed, such as assertion-based verification and constrained random simulation. A very powerful modern software verification technique is test-driven development (TDD). (In this context, the word "test" refers to functional verification, not manufacturing test.) One aspect of this technique is a unit test framework, which is a software platform that facilitates the development of tests for small pieces of behavior. The MyHDL designer has a choice of several of the unit test frameworks available for Python. However, the most important aspect of TDD is as a methodology. The idea is to develop the test before the implementation. In fact, the implementation is said to be driven by a set of existing tests. Writing the test first guarantees that the designer's mind is not yet cluttered with implementation details. This makes it easier to develop complete tests covering all features including corner cases.